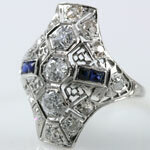 Bring the roar of the 1920s home with this Art Deco diamond and blue sapphire dinner ring. 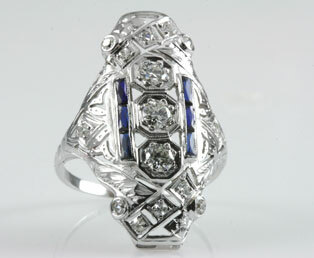 Three old-European diamonds (color G -H) are vertically aligned in the center of this long estate ring. These center diamonds are mounted in a hexagonal setting that enhances their size. Additional radiance is added with the light reflection of twelve single cut diamonds. Six vertically aligned blue sapphires add an extra element of excitement to this fascinating ring. This 18kt white gold mounting shows intricate gold work that has been pierced by hand. Delicate flowers are engraved for a delightful finish.